You'll Love Our Service, or It's Free! *Price per room/area up to 225 sq. ft. per room/area. Expires 5/31/19. 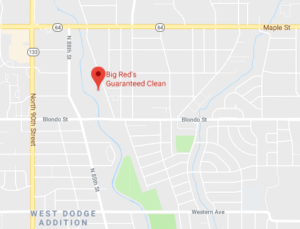 Big Red's Guaranteed Clean has been serving the people of Omaha Nebraska, Lincoln Nebraska, Fremont Nebraska, Western Iowa and all the great towns and communities in between since 1985 providing the best quality and guarantee in our industry. We provide professional Carpet Cleaning and Carpet Re-Stretching to which we use the most up to date techniques and equipment. We also provide professional Area Rug Cleaning and Upholstery Cleaning. We are certified and trained as Master Rug Cleaners. There are 5 methods of carpet cleaning available today – Guaranteed Clean is the only company in town that provides all of them. We choose the best method to safely and successfully clean each type of carpet in any given situation. We can make repairs for many of the common everyday occurrences that damage your carpet, like pet damage, staining or bleaching, split seams or we can re-work carpet that has been removed for the installation of cabinets, entertainment centers, bars, etc. We will use a combination of technician experience, black lights, and moisture sensors to pinpoint the areas of damage and we will offer the most comprehensive guarantee possible based on the service level you choose. Rex Anderson, owner of Guaranteed Clean has completed the Master Rug Cleaner program. Master Rug Cleaner program graduates are members of the international network of oriental and specialty rug cleaning professionals who have achieved the highest designation in the industry. Guaranteed Clean offers 3 floor cleaning methods. Regardless of the method used, we use only the best tools, equipment and chemicals on the market and give you the best value available. Guaranteed Clean offers wet mopping, machine scrubbing, turbo hybrid cleaning, and sealing. We carefully select only the best tools, equipment and chemicals on the market to clean your tiled floors. When water, fire or smoke gets into your home or business and causes water damage it is important that you are working with the right company and one that’s certified in water, fire and smoke damage repair and restoration. Upholstery cleaning procedures vary based on the type of material being cleaned. What makes Guaranteed Clean different is the overall way that we clean, combined with the training and safety precautions that we take, to clean even the most difficult fabrics. Thank you for Voting us Omaha’s Choice Best Carpet Cleaners!